Over the course of my 70-plus years as a journalist, I’ve reviewed hundreds of books, many of them informative and educational. 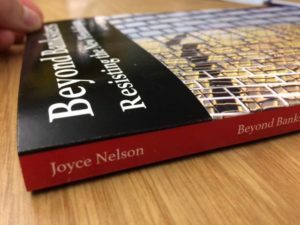 But Joyce Nelson’s Beyond Banksters, which I’ve just finished reading, is not only the most enlightening book I’ve ever wanted to review, but by far the most challenging. It’s not that it’s difficult to read. Far from it. Joyce is renowned for both the clarity of her prose and for her meticulous research, both of which are on display in this, her latest blockbuster. The challenge it poses to a prospective reviewer is that its succinct 164 pages are jam-packed with vital facts, figures, insights and revelations. So many that it’s impossible to adequately summarize it in the normal 800 or 1,000-word book review. While I was reading it, I stuck post-it slips on the pages that contained sentences and paragraphs that particularly impressed me. On all the previous books I had to review, these sticky notes would number no more than a dozen, but in Beyond Banksters I wound up with 97 of them — and in only 164 pages. The book looked like a literary porcupine. But in 1974. . . the Bank of Canada stopped lending to federal and provincial governments, forcing them to borrow from private (banks) and foreign lenders at compound interest rates – resulting in huge deficits and debts ever since. Unlike other developed countries in the G-7, Canada still has a publicly owned central bank. That is why COMER launched its lawsuit: it is still possible to return the Bank of Canada to its original mandate. The newly elected government of Justin Trudeau, however, seems intent on bypassing the COMER lawsuit by instituting an entirely different (partly private) bank for building infrastructure — one that will further indebt the country. In the globalized economy, giant investors expect to be able to pry open and seize the public assets of any country. . . Over the past two decades, and increasingly since 2008, big investors like Bank of America, JP Morgan Chase, Goldman Sachs, and Morgan Stanley have been buying up and gaining control over what’s known as “the real economy” — the already-built airports, seaports, roads, electricity production and transmission systems, water and wastewater systems, utilities, etc., across much of the developed world. These investments provide shareholders with increasingly long-term, steady profits from tolls and rents that previously went to the public owners of the infrastructure. The loss of public memory has been brutal. As economist Michael Hudson recently recalled, “The private banks (since 1974) have had a huge lobbying power over governments.” That lobbying power apparently hasn’t diminished at all over the decades. The Justin Trudeau Liberals are now embracing trade deals like CETA and the TPP which, if ratified, will prevent banking and monetary reform — not just in Canada, but across the planet. The Canada-EU trade deal (CETA) will allow for dozens more corporate lawsuits to be filed each year against the Canadian government under its draconian investor-state dispute settlement mechanism. The ISDS — first introduced in NAFTA — allows foreign multinational corporations to sue elected governments for laws or policies that they feel would decrease their future profits. As of January 201 5, there had been 37 known ISDS claims against Canada under NAFTA, with settled awards to corporations amounting to about US$341 million. An additional $65 million was spent in court costs and legal fees, and the federal government still faces over $2.6 billion in pending claims. Back in 2009, the Liberal Dalton McGuinty government of Ontario paid Goldman Sachs and CIBC World Markets $200,000 to assess the value of the province’s Crown assets, including Hydro One’s 150,000 kilometres of transmission lines — one of the largest electricity transmission lines in North America. Praising the Trudeau Liberals for their support of the Trans-Pacific Partnership, Scotiabank CEO Brian Porter cautioned that infrastructure projects undertaken should be those that will create jobs. One such project he favoured was the $16 billion Energy East pipeline that would transport tar sands diluted bitumen (dilbit) from Alberta to New Brunswick, where it would be exported to refineries in the U.S. and potentially Europe. He claimed it would create “tens of thousands of jobs” and generate billions in tax revenues. Most Canadians might be surprised to learn that the Canadian Pension Plan Investment Board has been putting vast amounts of their CPP contributions into tar sands companies. The CCPIB has invested $286 million in TransCanada Corp., $357 million in Enbridge, $294 million in Canadian Natural Resources Ltd., $268 million in Suncor, $86 million in Cenovus, and $34 million in Imperial Oil. More than a dozen foreign oil companies also receive CCPIB investments amounting to about $700 million, including Chevron ($111 million, ExxonMobil ($103 million), and Royal Dutch Shell ($30 million). This review, although rather longer than usual, should not be considered a substitute for reading the entire contents of the book. It contains a plethora of salient facts, figures, and analysis that I doubt more than one in ten Canadians has seen before. I don’t often refer to a book as an urgently “must-read,” but this one definitely fits that description. Ed Finn was Senior Editor at the CCPA and editor of the CCPA Monitor from 1994-2014. Formerly, as a journalist, he worked at The Montreal Gazette and for 14 years wrote a column on labour relations for The Toronto Star. He also served for three decades as a communications officer for several labour organizations, including the Canadian Labour Congress and the Canadian Union of Public Employees. And yes, Ed is a true nonagenarian, having celebrated his 90th birthday last year. 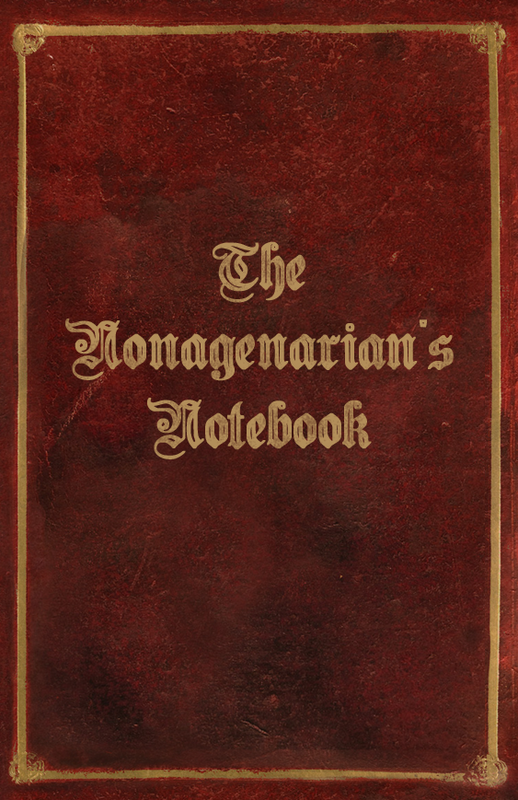 Stay tuned for more passages from The Nonagenarian’s Notebook. I look forward to returning to this site. Great read and an eye opening! In the environmental arena one need only look to a recent article in the tyee about the practice of reliance. Further distortions of sound bits come from the mouths of our politicans saying they support seniors and the midle class. If so then please explain the situation former sears and nortel and others face in the event of a bankruptcy. Why are they back of the line behind all other creditors if our politicians can be trusted on their pre election promises.